NOTE: Healing Music Volume 2 is a double album comprised of eight lengthy tracks as well as radio edits (shortened for airplay) for the original eight tracks, plus a new track and an extended version of the first two tracks. Due to space limitations, this review covers only disc 1, which contain the original eight tracks. Valerie Romanoff is a musician with two personas, which she describes via her Valrock Music catalogue as STILL, CHILL, THRILL. The "thrill" aspect is addressed when she tours and plays live with her groove/dance-oriented band, Spirit Jamfest. 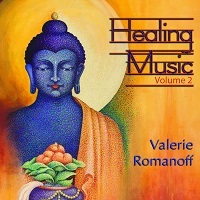 The other two sides to her musical oeuvre are covered, and exemplified I might add, by the music on Healing Music Volume 2. There are some gentle, serene "still" pieces and also some more energetic but-not-overly-so "chill" tracks. Believe it or not, the mixture works, i.e. the transition from a still track to a chill one does not happen abruptly and, to be honest, I sometimes have to look at the CD digipack to see if I am in one "mode" or the other" (although as a chill track revs up, it becomes more apparent and obvious). Romanoff plays guitar, piano and synth and is joined by Tom Rossi on flute, kora, and percussion and sitar maestro Stevin McNamara. If you surmised by the latter's appearance that the music will have an Indian flair to it, pat yourself on the back. Some of the album does indeed have a strong Indian influence. Besides McNamara's sitar, Rossi plays tamboura drone and tabla and his flute is, unless I am mistaken, bansuri. Yet, owing to Romanoff's guitar, the sound is definitely more a fusion of Indian with new age/folk, a dash of blues, and even a bit of rock (not a lot of the latter and what is there is damned tasty!). The first two songs, "Pink Skies Over Still Water" and "Pink Skies Over Waves" feature a stronger Indian presence than some of the other remaining six tracks. However, even those two pieces, while starting off in a close-to-authentic world beat scenario do evolve as Romanoff intersperses her acoustic guitar runs (and she can surely play!). In fact, at the midpoint of the first song, I started hearing echoes of Bruce BecVar in her guitar melody and also a hint of the tropics (no doubt keying in on the "water" mention in the title). This first track is quite mellow (Romanoff's synths have a classic new age sound to them, when they surface, although she relies much less on them than she does her guitar). The second track repeats a refrain from the first song, but almost immediately the music heads into a more pronounced new age/relaxation vein than the previous track's Indian influence, although Rossi's bansuri flute does interject some Indian spice. This song has a wonderful sense of "lightness" to it, and Romanoff's delicate and technically adept fingerstyle playing sparkles. Before giving a brief mention of the remaining tracks, you should know that the shortest tracks on this (first) disc are almost seven minutes long, and one is 17+ minutes. The latter one, "Dawn of Tao" is flagged as both "still" and "chill," and it does a lot of the latter. In fact, as I listened to it, I flashbacked to the late '60s when bands from the San Francisco scene frequently (especially when playing live) featured extensive jams in the middle of songs. Back then, fans were divided in how they felt about these "jam sessions," but I always liked them, and I like this one a lot. On this track, Romanoff takes out her electric guitar and "duets herself" on piano. The song starts off in a sedate vein and eventually starts to cook with some truly delicious guitar licks, settles back down, and then revs up again. Let me clarify though that "revving up" here is not "Stairway to Heaven" revving up, but it is more uptempo and "cheery" than the other music here. As I stated earlier, all eight tracks have a cohesion that makes the album "play through" with ease. You may not, as I wasn't, even be conscious sometimes of the movement from "still" to "chill" until you concentrate on what you are hearing. The other five tracks are all variations on the themes I have laid out above, some having little world influence, such as "Backdrop," which is a laid-back folk-rock number (there is sitar on the track, but it serves more as accompaniment to the more western mood of the song). Romanoff shifts from playing rhythm guitar (chords) to lead here and there, but no matter what the mood, tempo, style, etc. her playing is both artistically and technically spot on. The more I listened to the less Indian style music on the album, another artist (besides BecVar) came to mind and this was Mike Howe, a multi-instrumentalist who released a series of excellent albums on the Real Music label. What Romanoff, Howe, and BecVar all display is superb taste in composing and playing music that could easily slide into excessive soloing, but never does. That level of artistry and deftness is not common. I loved delving deep into the heart ofHealing Music Volume 2 and discovering that, as it unfolded through multiple playings, I kept hearing something new each and every time. Whether you want to be still or just chill, Valerie Romanoff has you covered.